At least 14 people have been killed and 10 others injured after suspected Al-Shabaab militia attacked a village in Mandera town. 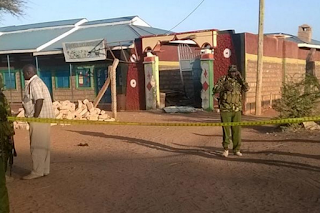 According to Mandera County Commissioner Alex Ole Nkoyo who confirmed the attack, it happened at 1am in Soko Mbuzi village. The commissioner said that the attackers struck when the villagers were sleeping and killed them. The terrorists planted grenades on the doors but most of the people were sleeping in tents outside their houses due to the hot weather. The attackers then threw petrol bombs at the tents where the people were sleeping before spraying bullets. This attack comes just months after Al-Shabaab militants killed 36 non-Muslim quarry workers in the same county.